Motorcades, villains, a Delorean, a special costume – an enormous amount of effort went in to making Erik’s wish of being a superhero for a day come true. And in that effort, he touched thousands of hearts. As news of his special day spread, donations poured in to the Make-a-Wish foundation. 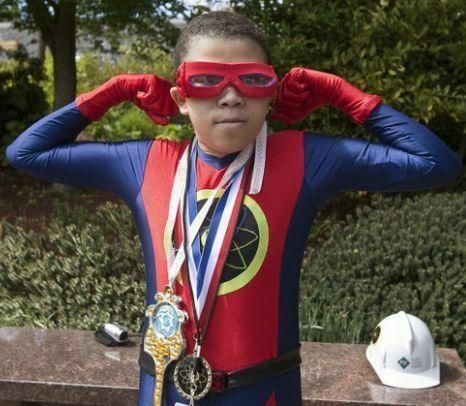 ~Rest in peace little man, your work here on earth is done, but your super powers of touching other peoples heart and making them care has just multiplied ten fold. God Bless you and your family!! ~A true Super Hero is not someone with special powers. Anyone who is bulletproof can stand up against danger. Erik (as I’ve just come to know) was the opposite. He had fewer powers than the rest of us, but he chose to think about the well being of others. Now THAT is a Super Hero! I’m touched beyond words. I go to the Legacy page looking to see what celebrities we’ve lost. I never expected to see this. Much love to his family and friends. Thank you for sharing Erik, and his story. ~A very moving story. Thank God we have true life Super Heroes like Erik “Electron Boy” Martin. They give the rest of us hope. Erik was a blessing. Thank you for sharing his story. ~What a touching story! I am inspired by Erik and amazed at the Martins; in my opinion, you are all super heros. Deepest sympathy for your loss & thank you for making Erik’s dream come true. ~This little hero saved a lot more than just those listed in his story. I’m in Ohio, crying my eyes out right now reading this story, and promising Electron Boy that I will do good works in his name. Erik Martin, you are my hero. Faster than a speeding bullet…more powerful than a locomotive. Look, up in the sky. It’s a bird! It’s a plane! It’s our own Electron Boy, an Angel protector for us all. You were an Angel on earth, too, Little Guy. We needed a hero, and you were here. God Bless you, your loving family, and your legion of friends. You’ve brought out the best in all of us. To read more about Erik’s incredible life, see his obituary. To read condolences and share your own, visit his Guest Book. This entry was posted in In the News and tagged Condolences, Obituaries, Tributes. Bookmark the permalink.